Students and adults alike can enjoy making impressions from these extremely life-like rubber fish replicas. Originating in 19th century Japan, gyotaku (meaning "print fish") developed from the need to record the exact size of a trophy catch and evolved into a beautiful art form in its own right. The process is simple. Apply tempera or block printing ink directly to the fish with foam brayers or soft brushes, then place printmaking paper over the fish and rub! The monoprint results will be different each time. Make prints for hanging, wrapping paper, banners, even T-shirts (use water-base screen printing inks that can be heat set). In the classroom Gyotaku can be used to stimulate discussions about species of fish, Japanese culture, and nature printing in general. Cast from real fish, these rubber replicas are life size, ranging from 4" (Sea Horse) to 11-3/4" long (Trout) and are flat on one side. 9-Piece Fish Set — This set includes a replica from the species Blue Gill, Star Fish, Flounder, Piranha, Angel Fish, Trout, Perch, Bass, and a small Walleye Pike. 4-Piece Fish Set — This set includes a replica from the species Flounder, Piranha, Angel Fish, and Bass. 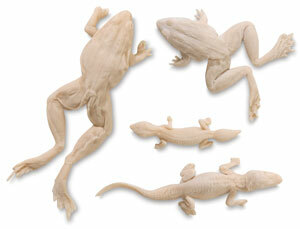 4-Piece Reptile Set — This set includes a replica of the Bull Frog, Grass Frog, Alligator, and Gecko.